Since childhood, I've loved fairytales and fantasy. Particularly the fight between good and evil and the all-consuming love story fascinate me. I'm also passionate about animals and nature and I believe that we should take care of the planet and each other. I had the chance to combine the two in my book. I began writing on the book in 2003 but didn't have the story right in my head yet. Then I waited (many years) until the story found its way to my pen. The Dawn of Skye by E.B. Heimdal is a gripping story that combines a dystopian setting with a densely plotted adventure to offer readers a fascinating tale, especially younger readers. Meet Skye and her twin brother, Ecco, as they cling to life, barely managing to survive in an unforgiving world after all the grownups have been killed by a mysterious disease. But they aren’t the only youngsters in this wilderness. There are others like them, and some of the groups are not particularly friendly. In this spellbinding story, readers follow the journey of these characters as they face untold challenges, confront their fears, and prepare themselves for the inevitable. One of the questions that keeps revisiting their minds is: will the disease return and how long can they survive? This is an incredible story with a strong setting, beautifully crafted to create vivid images in the minds of readers. The story has many lessons in hope, friendship and love, the power of faith, and what it takes to meet the challenges of life. It is interesting to see how the characters work together to find solutions and to beat the odds stacked against them. I was drawn in by E.B. Heimdal’s lyrical style of writing and the fluidity of the prose. The poem featured at the beginning of the story is highly inspirational and will stay with me, like a mantra. The Dawn of Skye is beautifully paced and readers will care about the characters. I was worried about them from the very beginning of the story. Apart from the masterful art of storytelling, Heimdal’s lessons will encourage young readers to cultivate values of teamwork, to find courage in friendship, and to believe in their ability to triumph over the challenges of life. I found this novel to be delightful, with exceptional and memorable characters. The Dawn of Skye by E.B. Heimdal is an adventure with a fascinating setting, a story that will appeal to young readers as well as adults. Skye and her twin brother, Ecco, find themselves in a world where grown-ups are all dead; thanks to a mysterious disease that attacks only people within a certain age limit. It’s a dystopian setting, and the twins find themselves living in the woods under very austere conditions for five years. The only problem is that they are not the only ones left and some of the groups that have survived are a hunting pack. In a world turned into a jungle, where only the strongest survive, who can they trust, and for how long before the deadly virus gets into their system? This is a story of adventure and survival against all odds, masterfully crafted to keep the reader turning the pages nonstop. E.B. Heimdal’s writing is fascinating, crisp, and it literally sings in the reader’s ears. The author paints a vivid setting, allowing readers to savor beautiful sights and landscapes, an imaginary setting that will bring dreams into the minds of the readers after they are done reading the book. There is a striking balance between the different elements of the story and the balance in this work is one of genius. Readers can’t help but enjoy the exciting setting, the great characters, and the fast-paced, gripping plot. The Dawn of Skye is a story infused with realism, one of those rare tales that explore survival, determination, friendship, and hope. The Dawn of Skye by E.B. Heimdal is a dystopian novel set in a future where the adults are killed by a mysterious illness, leaving the children to grow up and survive on their own. In order to survive, the children form different factions of alliances: Skye and Ecco are two siblings constantly on the run, while Dagwood is a leader struggling to keep order, Salomon hides dark secrets, and Puk connects to everyone around him, leading others in the clan to call him weak. As they band together, they must learn who is an enemy and who is a friend as the mysterious illness that took their parents may have returned. Reminiscent of Lord of the Flies, the characters (each of them being a child or teenager) are thrown into the wilderness alone and forced to figure out how to survive while growing up. They're endearing and sympathetic, flawed with a strong voice, as E.B. Heimdal provides multiple perspectives to show humanity and human nature. The main enemy is fear that leads Skye and Ecco to assume everyone is out to hurt them, while we're shown that several of the other clans are trying to keep to themselves and away from the others. Of the characters, Puk stands out to me the most. He is considered weak by the other kids because he's sensitive to what others are feeling, he's often bullied, but his heart is the essence of the story. His relationship with a little boar named Twice is sweet and endearing, as he cares for instead of hunts this orphaned animal. He sees the good and the bad in people, and though he's seen as a bit naive, he somehow understands more than anyone else. Gripping and captivating, The Dawn of Skye is a coming of age story of survival, friendship, loss, and trust. A fascinating and unique tale, The Dawn of Skye (The Someday Children Book 1) will pull readers in from the first few lines. Author E.B. Heimdal has created a tale of death, unknown enemies, survival and friendship. A fog, which almost seems to have a consciousness, makes its way from village to village, attacking and eventually killing the adult members of the communities. This leaves the children to fend for themselves. Ecco and Skye, twin brother and sister, are quite young when this first happens and then spend many years alone together in the woods, learning to survive. Yet, there are other survivors. There is often more danger surrounding the children than the elements, the larger predatory animals and the lack of knowledge. There is danger from other children and young adults. As this book is the beginning of a series, the question remains as to whether or not the killer fog will return or attack them as they get older. But Heimdal includes other struggles too as the children move through puberty and how they learn to handle those feelings and experiences. At the core, The Dawn of Skye shines a light on trust in one's self and creating trust and loyalty amongst one's closest friends. E.B. Heimdal's The Dawn of Skye is a different take on why young adults and children have to survive on their own. It is exceptionally well-written and quickly helps readers feel an emotional connection to the main characters, especially Skye. Not only does the author express the struggle for the children, but she displays the depth of the different characters. One example is how Puk bonds early on with a young roundsnout he found still alive. Later, there is a memory that Flo recalls that is deeply troubling to her. 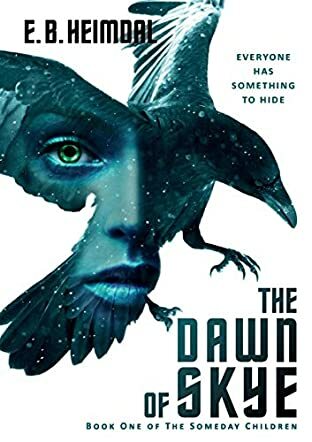 The Dawn of Skye is a highly entertaining story. E.B. Heimdal does an excellent job of offering some level of closure as she wraps up this first book in the series, all while creating a yearning within readers to want to know what happens next. Well done. The Dawn of Skye by E.B. Heimdal is the first book in the young adult adventure series The Someday Children. This is a book that would appeal most to an audience made up primarily of young adults who enjoy dystopian universe survival stories. In a world without grownups, twin siblings Ecco and Skye have been living all by themselves in the woods, but other groups of children wander through the woods and not all of them are friendly. What killed off all the grownups and whom should the twins trust and whom should they fear? Move over Gold-Eye Ella, Drum, and Ninde to make room for Ecco and Skye in The Dawn of Skye by E.B. Heimdal! I really liked the fact that the book began with a map and a list of the different clans and groups that told me which characters were in which group. The map and the list proved to be very helpful in keeping track of where Ecco and Skye were throughout the story, and the list helped me to keep track of loyalties. My favorite part of the book is when Skye makes the decision to try to let Dagwood and his people into her heart so that they can help her heal. It was one of those moments that was just filled with so much emotion that it made Skye feel so much like a real person and less like a fictional character. Overall, I really enjoyed reading this book and I look forward to the author writing the rest of the series!